Over the past several years, I’ve tried my hand at making homemade cinnamon rolls SO many times. 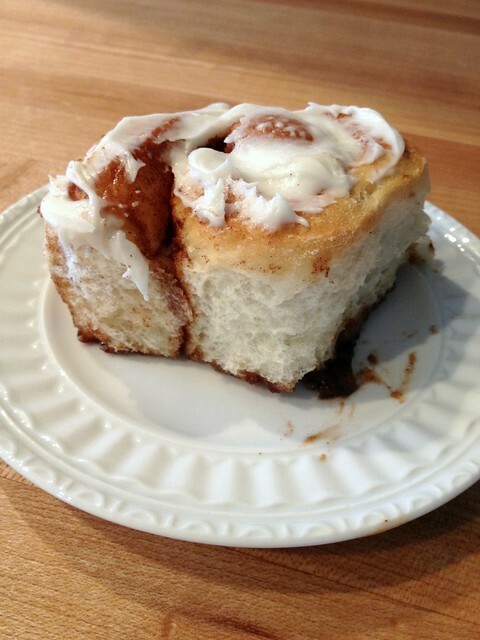 Every time, they turn out tasting “pretty good” (they are cinnamon rolls after all) but there’s always something missing. Either it’s too sweet, not sweet enough, too tough, too sticky, etc. etc. I will say that I’m pretty picky when it comes to cinnamon rolls — and Dave has spoiled his whole life because his mom makes really good homemade cinnamon rolls… so maybe we both had kind of high standards. Another part of the problem is that I’m not willing to make homemade cinnamon rolls if they take all day or require 35 different ingredients. Well, after numerous cinnamon roll conversations with Dave’s mom, searching the internet for various different recipes and tips, and lots of trial and error, I feel like I’m finally starting to find my groove when it comes to making homemade cinnamon rolls. 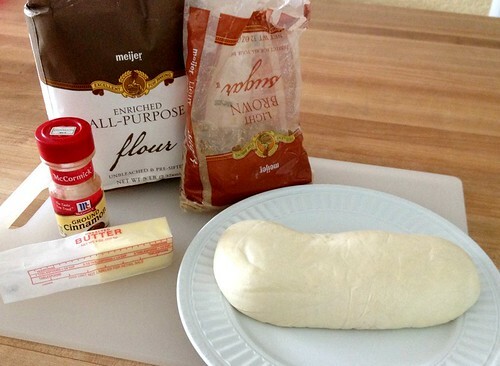 I have a super simple recipe that starts with a loaf of frozen bread dough, uses ingredients you most likely already have on hand, and tastes pretty darn good! 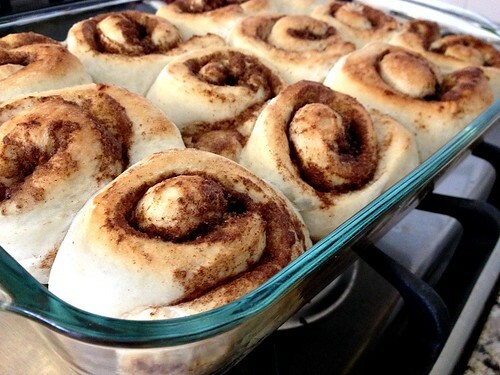 Best of all, you can easily make these rolls the night before so breakfast is ready when you wake up! 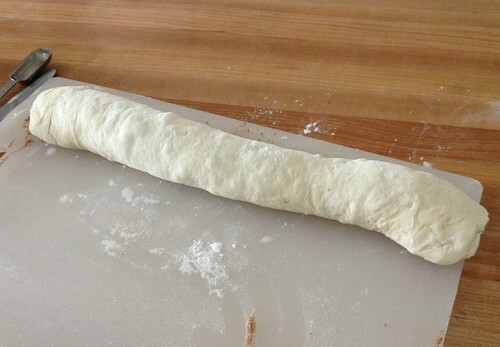 One tip I have is to try and handle the dough as little as possible. I think over handling it make the finished product a bit tough. 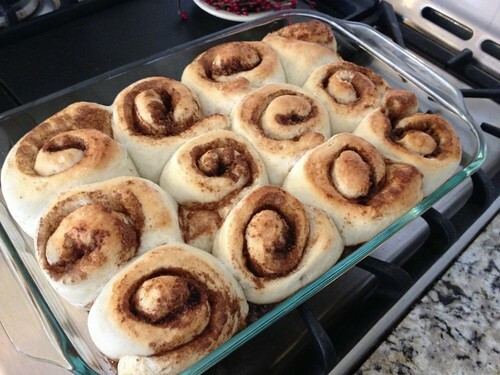 What are your tips for yummy homemade cinnamon rolls? Thanks so much! Have been looking for something like this for years! oh good — hope you enjoy them. Merry Christmas to you too! We (my 3 yr old son and I) have made these twice in the last couple weeks…once using bread maker pizza dough and tonight using wheat dinner roll bread maker dough. He has the best time smearing butter and doing the sugar/cinnamon job! Delicious both times! Tonight, I used 2 pie plates and liked how the rolls came out “shorter”… perfect size and cuts down on the guilt from eating too many right out of the oven. 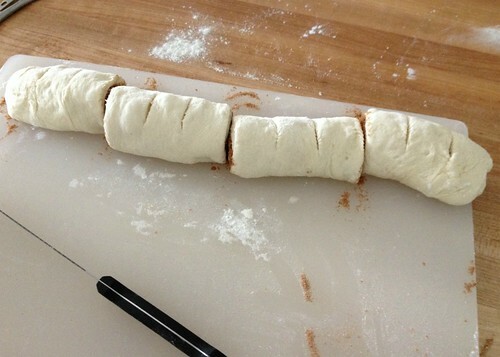 Of course, it may be that they were shorter because the dough was half wheat. Anyway, this recipe is going in my permanent recipe box! My family thanks you – from NM. haha — glad you like them so much!! I’ve never tried it, but I would freeze them before letting them rise. Then, when I defrosted them, I would let them rise and pop them in the oven! Hi Andrea, I just recently found your blog and have loved it!!! So many practical and inspiring ideas. I’ve always loved making cinnamon rolls and you just made it easier (than waiting three hours for my bread machine). Thank you and God’s blessings on your newest little boy! Would this work with a scone dough? My mum made somsometh similar when I was growing up and im sure it was a scone dough she used. I don’t think you can buy frozen dough here in New Zealand. Can I just say I love that your rectangle isn’t perfect. 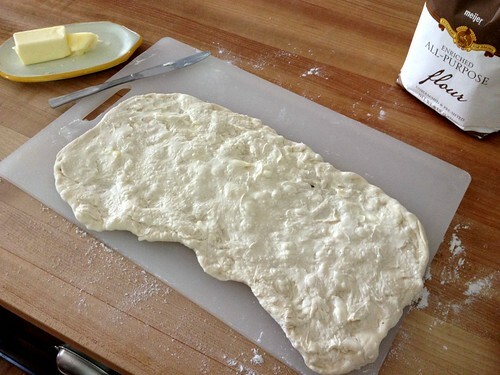 I do appreciate the food bloggers who have worked so hard to present photos of preciously measured and cut dough, however that’s just not reality for those of us who actually have a life. Never in thirty-five years of baking have my rectangles come out perfect. Thanks for keeping it real, Andrea. Happy Thursday! These look delicious and easy to make! However, the recipe name is a bit misleading since using frozen bread dough is not really homemade. They are home baked., for sure. I use the rapid rise yeast and it really doesn’t take that long. Granted, if I had 3 small children, Cinnamon rolls is not something I would even consider baking!! We love cinnamon rolls! I’ve tried Rhodes frozen cinnamon rolls and it’s quite good for something frozen. 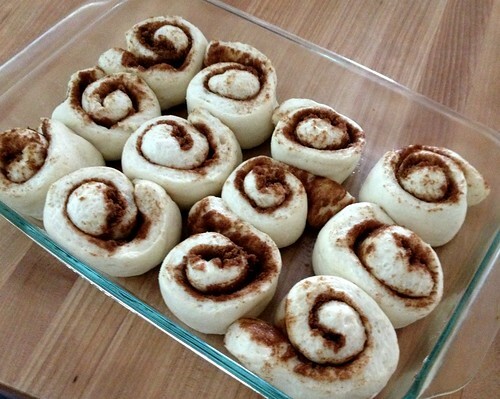 It’s my go-to stash if I’m craving for cinnamon rolls at home. There’s a couple of restaurants in our area that makes VERY delicious and HUGE cinnamon rolls. My husband and I usually split it. 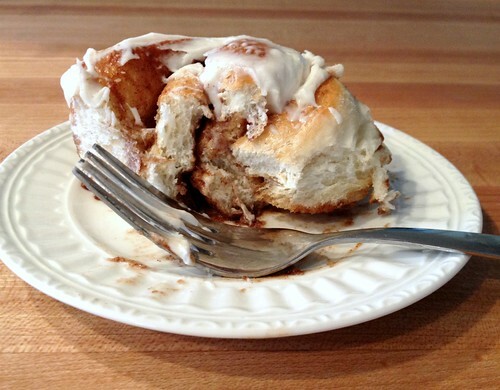 Cinnamon rolls are one of those food that doesn’t taste as good to me as a leftover. That’s probably why we don’t have it at home often. I will save this recipe though so I can try making it myself next time we have guests. I’ve tried the Rhodes dough too and thought they were pretty good. If I had to choose though, I’d go with the Pillsbury refrigerated cinnamon rolls every time. I LOVE those! Dave is the big lover of the homemade cinnamon rolls, so he’s mainly why I make them. Thankfully, he will GLADLY eat them as leftovers so nothing goes to waste! 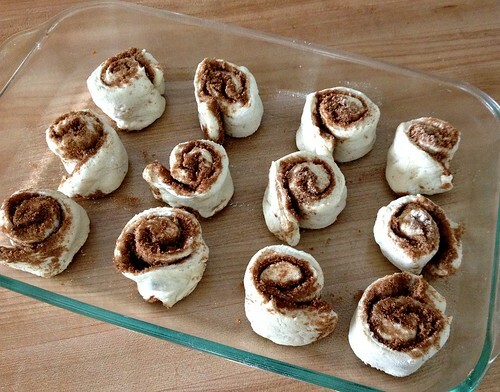 How does this recipe differ from other (American) cinnamon roll recipes? I’m asking since I’m from Finland and had never thought that there could be several recipes for cinnamon rolls 😀 In Finland we use pulla dough (https://en.wikipedia.org/wiki/Pulla) which is pretty standard. 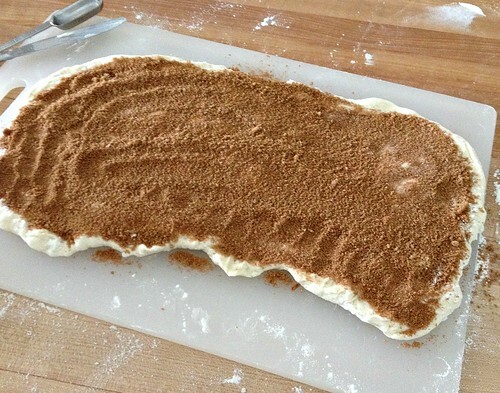 The filling is the same as you have: butter, sugar and cinnamon. We usually bake cinnamon rolls as individual buns called “korvapuusti” (literally translated as “slap on the ear”… weird, I know!). Best thing on a cold winter day is mug of hot chocolate and a big freshly warm korvapuusti! 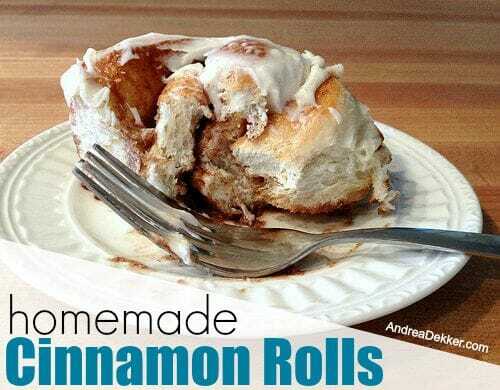 Andrea, this could be the best tutorial for making cinnamon rolls that I’ve ever seen. Thank you! What frosting do you use? Cream cheese? Thanks Kim — hope you love it!